This article first appeared in The Edge Financial Daily, on August 20, 2018. KUALA LUMPUR: The uncertainty surrounding fuel prices is AirAsia X Bhd’s (AAX) main challenge this year, its chief executive officer (CEO) Benyamin Ismail said, stopping short of committing to a repeat stellar performance achieved in the financial year ended Dec 31, 2017 (FY17). The long-haul, low-cost affiliate of AirAsia Group Bhd more than doubled its net profit to RM98.89 million in FY17 from RM44.84 million the previous year, while revenue grew 17% to RM4.56 billion from RM3.9 billion in FY16. “My biggest worry at the moment is fuel prices. There is one school of thought that is expecting fuel prices to be lower, while another school of thought expects them to go higher,” Benyamin told The Edge Financial Daily in an interview. He said the uncertainty caused by US President Donald Trump’s rhetoric had also led to fluctuations in oil prices. Recall that as early as April this year, Trump’s threat to put sanctions on Iran had pushed global oil prices up, while his tweet demanding that the Opec reduce prices of crude oil drove oil prices down in June. Benyamin said AAX now hedges 14% of its estimated fuel consumption compared with 40% about two years ago. Brent crude oil futures were traded at US$72.25 (RM296.62) a barrel last Friday. He also said the weakening ringgit against the US dollar has minimal impact on the airline’s business as half of its revenue is in foreign currencies. “The bulk of our revenue is from foreign travellers. Basically, about 45% to 50% of our revenue is earned in ringgit. The US dollar constitutes another 35%, while 15% is in Australian dollars. In terms of cost, about 45% is in US dollar and the rest is mainly in ringgit and other small currencies,” Benyamin said, adding that the revenue earned in foreign currencies acts as a natural hedge for AAX. It is worth noting that the airline’s borrowings of RM774.7 million as at the first quarter of FY18 (1QFY18) were mainly denominated in US dollars. For 1QFY18 ended March 31, AAX’s finance costs fell by 32.1% to RM7.26 million following a reduction of 29.2% of its total borrowings from RM1.09 billion in 1QFY17. Most of the borrowings that were pared down were US dollar-denominated borrowings. Benyamin also said AAX will add more destinations in China this year. Last Friday, AAX started four weekly flights between Kuala Lumpur and Amritsar in India. He said the airline also plans to begin flying to European cities such as Milan and Nice in one and a half years, as well as add more new destinations in the US like San Francisco and Los Angeles. AAX currently flies to Hawaii. Still, it will have to wait until it starts taking delivery of new aircraft next year. In July, AAX placed an order with Airbus for an additional 34 A330neo widebody aircraft, with deliveries scheduled to start from October 2019 through the second half of 2028. AAX recorded an impressive 1QFY18, which saw the airline’s net profit quadrupling to RM41.5 million from RM10.34 million a year ago, supported by a 13% year-on-year growth in passenger volume. 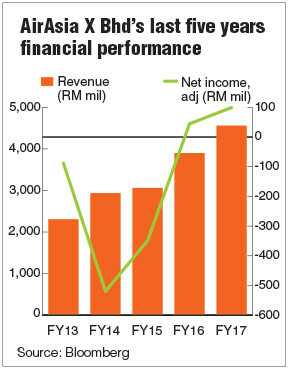 Quarterly revenue rose 7.2% to RM1.27 billion in 1QFY18 compared with RM1.18 billion in 1QFY17. Its 2QFY18 results will be released on Aug 30. In a report dated July 27, MIDF Research aviation analyst Danial Razak said it was observed that operational fronts had been strong in 2QFY18, which could signal another strong 2Q for AAX. “However, we are cognisant that there may be a few headwinds, including oil prices which have averaged 25.7% higher since the beginning of the year. Recall that fuel cost accounted for about 35% of total operating expenses,” he added, maintaining a “buy” call on AAX, with a target price (TP) of 47 sen.
Bloomberg data show that seven out of 11 analysts covering the airline have a “buy” recommendation, with an average TP of 43 sen, indicating a potential return of 21.1% from its closing price of 35.5 sen last Friday. AAX’s market capitalisation stood at RM1.47 billion.